Address: Room 802, # B3 Building, Wanda Plaza, Free Trade Zone Nansha Area, Guangzhou City, GuangDong Province, China. 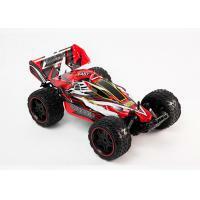 With over 16 inches huge size, monster bigfoot wheels, super cool PVC printing car shell and its amazing high speed driving of 15 kilometer / h, this RC car definitely easy to get children thrilled and happy. Non-toxic environment friendly ABS plastic and electric component. Exiquite encave bigfoot wheels,easy to drive on uneven terrain like mud, grass, off road, shallow water, etc. Full 4 channel functions of going forward, backward, turn left, turn right. The car is very high speed as much as 15Km/H. Please avoid hitting object during high speed running. Always keep battery far away from fire or water. There are small parts inside this toy, pls keep away from kids under 3-year old.